Granted, I have a big family of big eaters. Making French fries is a big deal because I know I’m going to have to commit, you know? Between scrubbing and cutting and frying and cutting and frying and cutting and frying – I’m making fries for at least an hour. Worth it? Oh my. So much worth it. But not often. It takes too much time. But guess what I just learned to do? I learned the lovely tricks it takes to make fries ahead of time for the freezer. All the cutting is done ahead so all we have to do at frying time is…fry. Beyond saving me time, I’ve discovered that this method of slightly pre-cooking them before frying is what crispy, perfect fries are made of. Come closer and learn with me. 1. Scrub a bunch of potatoes (or if you’re me, you ask your kids to scrub a bunch of potatoes, which they are happy to do because French Fries). 2. Cut the potatoes into fries – your preference on how thick or thin. 3. Put the cut potatoes into a big pot of water. Bring to a boil. 4. Once water/potatoes comes to a boil, remove the potatoes from heat and strain, running the potatoes under cold water to cool and stop the cooking process. 5. Blot the potatoes dry on a towel. 6. Transfer prepped fries into freezer bags for future use (although you might consider frying some immediately and I bet no one will argue). 7. 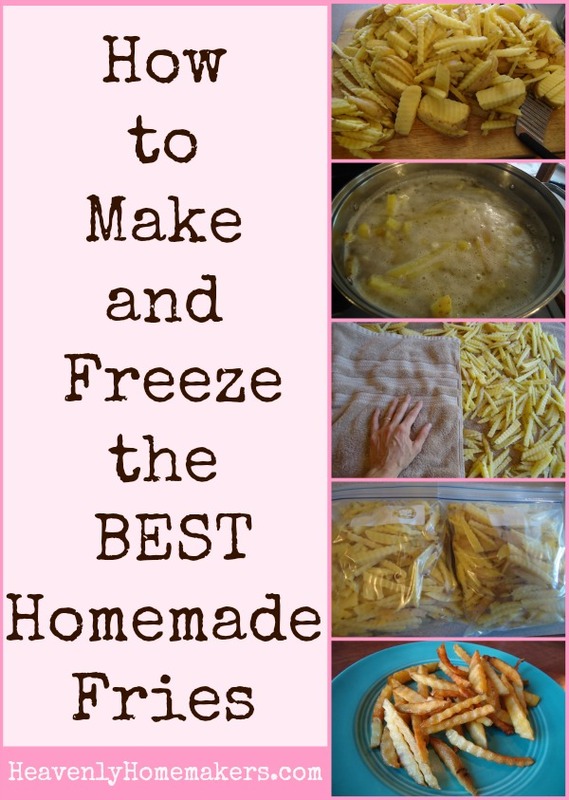 Freeze prepped French fries in freezer bags for up to two months. 8. 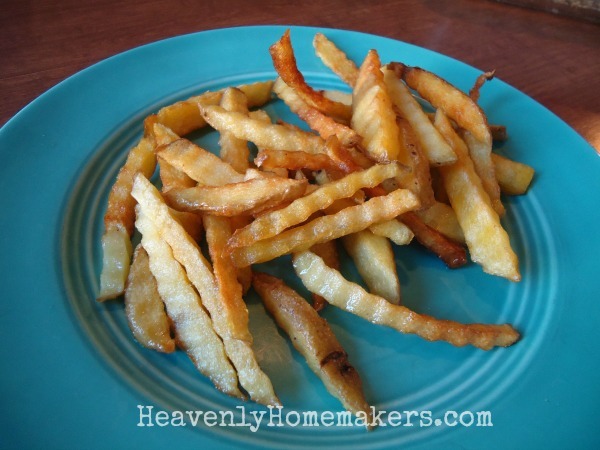 At frying time, get the fries out of the freezer a few minutes before you want to cook them. 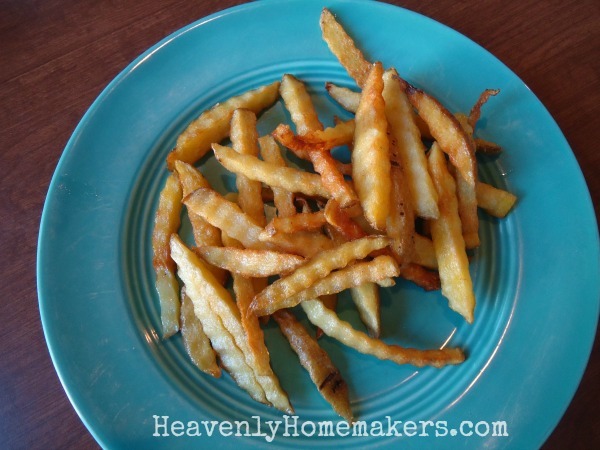 WARNING: Watch that the fries aren’t holding extra water as they will splatter when frying! Blot prepared fries with a towel before frying if necessary. You’ll never go back to making fries any other way after experiencing these. That list looks like a bunch of junk food, but it’s not! How great that we can make all of our favorites with healthier ingredients! Did you find some of these recipes to be helpful? Slowly but surely we can get ahead in the kitchen! Does this work for baked fries as well? Because I usually coat my fries in oil and bake them on my stone pan. I haven’t tried it, but I don’t know why it wouldn’t work! I have a pampered chef crinkle cutter, kind of like this one: https://www.amazon.com/gp/product/B000THCXZO?ie=UTF8&tag=wwwheavenlyho-20&camp=1789&linkCode=xm2&creativeASIN=B000THCXZO It’s amazing! When you are done frying do you reuse your oil for something else or dispose of it? Thank you. This is awesome, as I have yet to come across a storebought brand that doesn’t use the hydrogenated oils. Thank you! This is awesome! I am going to have to try this. I love french fries but hate the prep time! I,too, am a lover of french fries that are crispy, not too much work and crunchy without having to fry. I thought you might be interested in this recipe our family has loved this year and made much too often.